McDonald's says it is simplifying its grilled chicken recipe to remove ingredients people might not recognize, marking the latest sign the company is rethinking its menu to keep up with changing tastes. The company says it expects the new "Artisan Grilled Chicken" to be in its more than 14,300 U.S. stores by the end of next week, in products including a new sandwich, as well as existing sandwiches, wraps and salads. It says the biggest change is the removal of sodium phosphates, which it said was used to keep the chicken moist, in favor of vegetable starch. The new recipe also does not use maltodextrin, which McDonald's said is generally used as a sugar to increase browning or as a carrier for seasoning. Jessica Foust, director of culinary innovation at McDonald's, said the changes were made because customers said they want "simple, clean ingredients" they are familiar with. "Maltodextrin is just not something they have in their pantries," Foust said. The change comes as McDonald's fights to hold onto customers amid the growing popularity of places like Chipotle that position themselves as more wholesome alternatives to traditional fast-food. Already, that "clean label" trend has prompted numerous restaurant chains and packaged food makers to reformulate products, even while standing by the safety and quality of their previous recipes. Subway also introduced a new grilled chicken recipe earlier this year that it said had no artificial flavors or preservatives. And Panera Bread has said it plans to purge artificial colors, flavors and preservatives from its food by 2016. As ingredient quality becomes a more powerful marketing advantage, executives at McDonald's have also been trying to freshen up the company's image and shake perceptions that it serves junk food. TV ads and signs in stores, for instance, are playing up the fact that Egg McMuffins are made with freshly cracked eggs. And last month, McDonald's announced it would start asking suppliers to curb the use of antibiotics in raising chickens. As for the new grilled chicken recipe, McDonald's said it will now also be cooked with a blend of olive oil and canola oil and herb seasoning. Previously, it was cooked with liquid margarine, which included "artificial flavor" and the preservatives sodium benzoate and potassium sorbate as ingredients. Foust said she thinks customers will notice that it has "more of a lemon herb type flavor." "It's a very real chicken experience — something closer to what you make in your own home," she said. Roger Clemens, an adjunct professor of pharmaceutical sciences at the University of Southern California's School of Pharmacy and a former president of the Institute of Food Technologists, said sodium phosphates could be used to help chicken keep its moisture and texture when it's being frozen and shipped. "If you're going to cook a fresh chicken, it's not a big concern. But if you're going to ship a chicken, there's a change in structure," he said. Maltodextrin, meanwhile, might be used as a coating on chicken to distribute seasonings evenly, he said. On its website, McDonald's lists ingredients for its new "Artisan Grilled Chicken" including salt, vegetable starch, sugar, garlic powder, lemon juice concentrate, honey and onion powder. Terri Hickey, a McDonald's representative, said the new chicken filet will have 12 ingredients, not including the cooking ingredients. The previous filet recipe had 18 ingredients. Mike Andres, who took over as president of McDonald's USA last year amid ongoing sales struggles, had said in December the company was looking at shrinking its ingredients lists. Whether the new grilled chicken recipe helps change perceptions about the food at McDonald's remains to be seen. The change comes after McDonald's Corp. saw sales and customer visits at established U.S. restaurants slip two years in a row. In January, the company named Steve Easterbrook, its chief brand officer, to take over as CEO for Don Thompson. 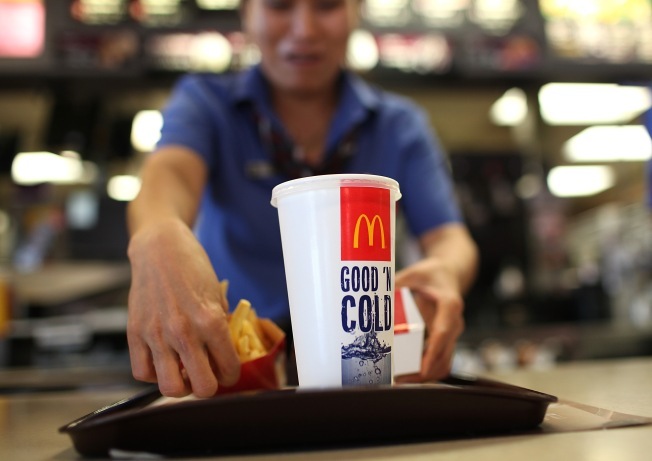 That change took effect in March, right before a "Turnaround Summit" for U.S. franchisees.